Located on the northern end of Edgewater directly on the Hudson River, Shelter Bay consists of 60 townhouse residences containing large 2 and 3-bedroom duplex and triplex units. Built in 1983 directly on the banks of the Hudson River, these condos were the epitome of exceptionally large, spacious luxury homes . It is just north and in walking distance of Veteran’s Field, a huge public park with a jogging track, baseball diamonds, the Edgewater Community Center, tennis and picnic grounds. 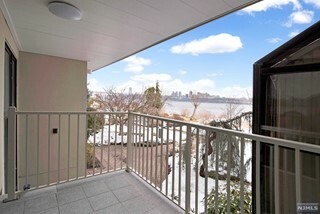 The exterior of each unit is wood and stucco and all units have ample spaced terraces with stunning views of the river, NYC and the George Washington Bridge. There are very few complexes anywhere that you are closer to the Hudson River Walkway than at Shelter Bay. Shelter Bay shares a 24-gatehouse with Hudson Cove and Hudson Harbour, but also has a separate gatehouse closer to its entrance. There is an outdoor pool and tennis courts for the exclusive use of its owners. Just outside the building is the #158 bus, taking you to The Port Authority in about 30 - 45 minutes. Free shuttle service is provided by Edgewater to the Edgewater Marina. The complex is located only a few blocks from the new George Washington School and some of the finest restaurants in the town including The River Palm Terrace and Le Jardin. All major highways and The George Washington Bridge are only 1 mile north of the complex and the major shopping areas within Edgewater are about a .5 to 2 miles south of the complex. There are 4 different floor plans for these townhouses. Some of the larger 3-bedroom units have been converted into 4-bedrooms/3 or 4 baths. All residences have huge bay windows, high ceilings and skylights, wood burning fireplaces, and private terraces. Some of the larger units have private elevators. The sizes range from approximately 1,600 to more than 4,000 square feet. Each unit has a 2-car garage, additional outdoor parking, separate laundry rooms and very large bedrooms and baths with jetted tubs. Shelter Bay sits right on the public Hudson River Walkway. It has a 24-hour gatehouse, outdoor pool and a tennis court. There is ample guest parking.